Rediff.com » News » When they came for the Muslims, where were you? Civil rights activist Lakshmi Sridaran highlights why South Asians must stand on the right side of history and resist the Trump administration's 'systematic attack' on the entire spectrum of America's immigration system. IMAGE: During a protest in New York City against President Donald Trump's 'Muslim ban'. SAALT's most recent report Power, Pain, Potential documents the uptick in violence and xenophobic political rhetoric aimed at South Asian, Muslim, Sikh, Hindu, Middle Eastern, and Arab American communities during the 2016 election cycle. An astounding 95 per cent of the incidents SAALT indexed were motivated by anti-Muslim sentiment. 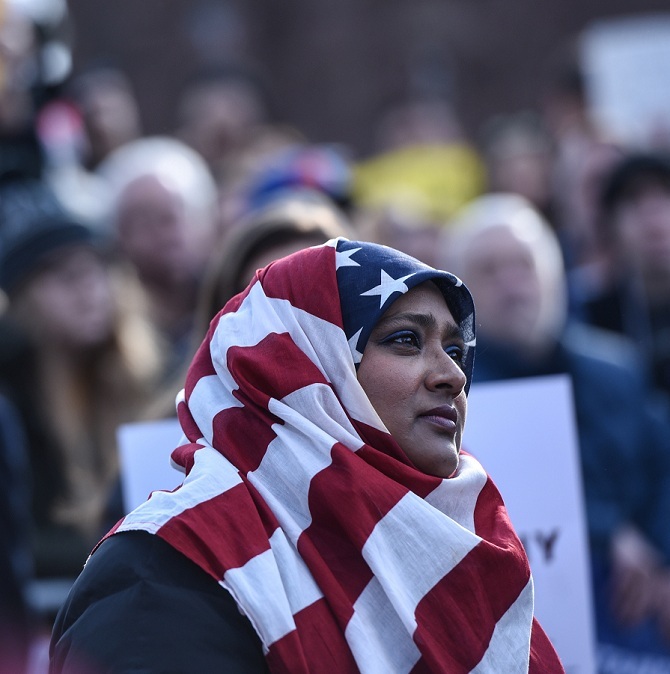 This has become a rallying cry against the anti-Muslim, anti-immigrant policies that have defined the first two weeks of Donald Trump's presidency. Wasting little time, President Trump has issued nearly 10 executive orders that roll back the progress President Obama took eight years to build. It began with gutting the Affordable Healthcare Act, then speeding up environmental review processes for infrastructure projects such as the Dakota Access Pipeline. Then came the one-two punch of immigration executive orders that in total included building a wall along the US-Mexico border, increasing the number of Customs and Border Patrol agents, threatening sanctuary cities that ensure immigrants are not interrogated about their documentation status when interacting with local police, banning refugees from Syria indefinitely along with immigrants from seven-Muslim majority countries, even a proposal to recreate an entry-exit registration system much like NSEERS or 'special registration' after 9/11. Most recently were the series of executive orders decreasing financial regulations and essentially stripping the Dodd-Frank Wall Street Reform and Consumer Financial Protection Act put in place to regulate big banks after the 2008 financial crisis. The amount of destruction these actions have already caused and the long-term impact they will continue to have feels at once both immense and immeasurable. And South Asians must care. Currently, none of the seven Muslim majority countries listed in the 'Protecting the Nation from Foreign Terrorist Entry' executive order -- also known as the 'Muslim Ban' -- are in South Asia. However, there have been calls from members of our own community to add Afghanistan, Pakistan, and Saudi Arabia to this list. Just last week, the Republican Hindu Coalition released a statement showing unfettered support for the 'Muslim Ban' and demanding the addition of these countries to the list. The Hindus for Justice Coalition swiftly responded with a counter press release in unequivocal solidarity with Muslim communities, refugees, and immigrants and condemned the RHC for supporting the rapid installment of racist and xenophobic policies by the Trump Administration. While non-Muslim South Asians may feel like this does not impact them, the climate of fear that Trump's rhetoric and policies have instilled in our communities goes beyond religion. An Indian-American woman, Aravinda Pillalamarri, was stopped by police in her Maryland neighbourhood of over 30 years, questioned about her legal status, detained, and told she was under criminal investigation until she was finally let go. The reality of racial and religious profiling in this country is that it is simply enough to be perceived as Muslim to be treated as one. In SAALT's most recent report Power, Pain, Potential released last month (external link), we document the uptick in violence and xenophobic political rhetoric aimed at South Asian, Muslim, Sikh, Hindu, Middle Eastern, and Arab American communities during the 2016 election cycle. An astounding 95 per cent of the 207 incidents we indexed were motivated by anti-Muslim sentiment. Trump has capitalised on anti-Muslim rhetoric as a candidate and now as president by exploiting the divisions in our communities to win over non-Muslim South Asians. This is a trap we cannot afford to fall into during this critical time. South Asian activists, attorneys, and community leaders around the country mobilised in the moments after the 'Muslim ban' executive order to ensure that individuals and families detained at airports after the announcement could be released, helped lead the litigation efforts around the country to temporarily halt the ban, and served on the frontlines ensuring communities were safe from raids and deportations. These are the actions we must continue taking and supporting as a community. Ironically, next on Trump's agenda will be a concerted effort to go after documented or 'legal\' immigrants. A leaked executive order from last week shows that Trump will be cracking down on H-1B and L1 visas, which many Indian tech companies rely on, accounting for upwards of 350,000 H-1B visas alone. The order would also raise the minimum salary for H-1B applicants from $60,000 to $130,000 in an effort to prioritise American-born workers. Even before the Muslim ban, Indian workers on H-1B visas have been facing lengthy delays to return home from visits to India due to 'administrative processing,' some taking several months. For the first time, we are seeing a systematic attack on the entire spectrum of our immigration system, and this means we must unite as a community to push back. Just this week Senator Tom Cotton (Republican, Arizona) introduced a bill called the Reforming American Immigration for Strong Employment (RAISE) Act, which aims to ambush legal immigration. It would significantly reduce the number of immigrants who can obtain green cards and other visas and would cut the number of legal immigrants allowed in the United States by 40 per cent in the first year and by 50 per cent over a decade. Rather than acknowledging the demand for immigrant labour that US economic policy has created, this bill is part of a coordinated effort to vilify immigrants. 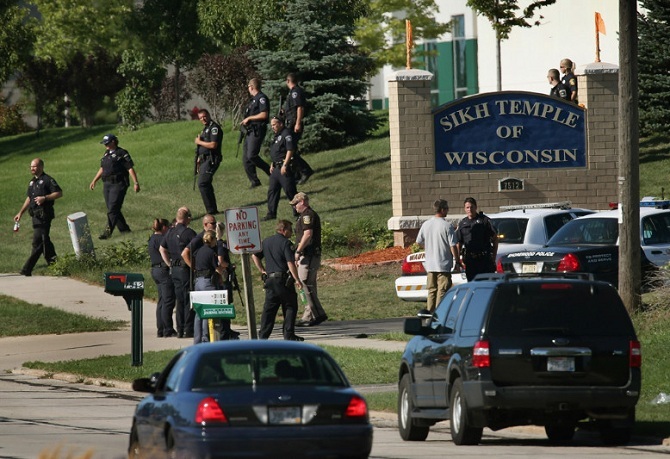 IMAGE: After a white supremacist attacked the Sikh Temple of Wisconsin on August 5, 2012, killing six people. President Obama had established the Countering Violent Extremism programme to include white supremacists and other non-Muslim groups. Trump plans to alter the programme to focus only on Muslims. In less popular news, the Trump administration is reportedly planning to shift the Countering Violent Extremism (CVE) programme to focus exclusively on Muslim communities by renaming it Countering Violent Islamic Extremism. The CVE programme was established under the Obama administration as an attempt to encourage community leaders to identify early signs of radicalisation in individuals and report them to the government. While the Obama administration attempted to include white supremacists and other non-Muslim groups in this programme, the Trump administration will focus singularly on Muslim communities. The programme itself can trace its origins back to the Counter Intelligence Programme deployed first in the 1950s to target the Communist Party and later to sabotage other movements for justice, most notably the Black liberation movement. This was done through FBI surveillance, infiltration, and disruption. The same structures of white supremacy that have historically underpinned our nation's policies are being utilised against Muslims, immigrants, and communities of colour today. The convergence of political rhetoric, legislative change, and executive action under the Trump administration is one that cannot and should not be underestimated. South Asian Americans stand to lose greatly, and now is not the time to be spectators to injustice, narrowly believing that these events that currently affect part of our community will not affect us all. We must be on the right side of history and resist every attempt by this administration to denigrate us, all immigrants, and other communities of colour. It is time to leverage the resources and political capital in our communities to stand against the coordinated attack on Muslims right now. Lakshmi Sridaran is the director of National Policy and Advocacy, South Asian Americans Leading Together -- a nonpartisan, non-profit civil rights organisation that elevates the voices of South Asians in the US.